Yale is a win away from history. The Bulldogs clinched a share of their first Ivy title since 2002 Friday night by defeating Harvard at Lavietes Pavilion in Boston, 62-52. The win, fueled by senior guard Javier Duren’s 22 points and nine rebounds, gives Yale the chance to earn its first NCAA tournament berth since 1962 with a win at Dartmouth tomorrow night. The Elis’ win at Harvard, which has represented the Ivy League in the NCAA tournament each of the past four seasons, played out in surprising fashion. Yale junior forward Justin Sears and Harvard senior guard Wesley Saunders, both Ivy Player of the Year candidates, combined for just 21 points on 7-for-17 shooting, with Saunders going scoreless from the 8:28 mark of the first half all the way until the 0:18 mark of the second half and Sears nailing his first two three-pointers of the season. The team’s respective sharpshooters – Harvard sophomore guard Corbin Miller and Yale junior guard Jack Montague – went 0-for-10 from beyond the arc, with Miller accounting for eight of those misses. In fact, three-point shooting was the difference. The Bulldogs shot 7-for-16 from downtown, whereas the Crimson, plagued by outside shooting woes for much of the season, shot just 2-for-17. Harvard senior forward Steve Moundou-Missi added 21 points and 10 rebounds. 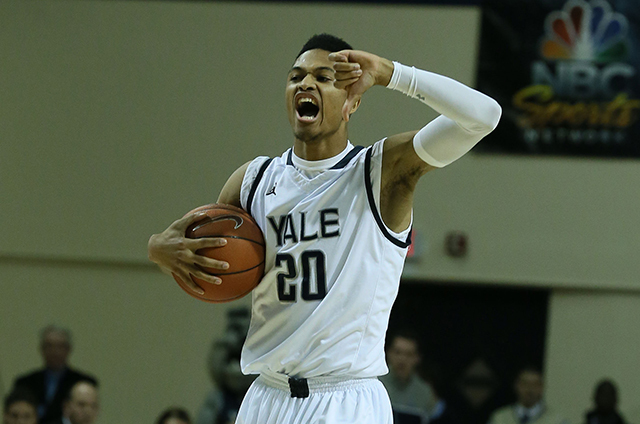 But Yale survived Sears’ foul trouble to pull away late, holding Harvard to 52 points for the second straight game after the Bulldogs lost 52-50 to Harvard at Payne Whitney Gym earlier this season. The win marked Yale’s second straight at Lavietes and earned Yale the spotlight on SportsCenter. Duren’s next quote looms large, though. “We feel good about this win, but we’ve been preachin’ that we still got one more win to go,” Duren said. That win will have to come at Dartmouth, which pulled off an incredible comeback against Brown Friday night, overcoming a 50-26 deficit with 13:58 remaining to obtain a 75-69 win over the Bears. Dartmouth also reeled off a 26-2 run en route to a 70-61 comeback win at Harvard, so the Big Green are more than worthy opponents for the Ivy conference-leading Elis. Dartmouth is fighting for a postseason bid of its own in the CIT. But just a win away from history, Yale has the perfect opportunity to practice what Duren and company are preaching. Yale had the mojo tonight. A special night for the Dawgs. Duren was the best player on the floor, though SM-M was also amazing. Clutch threes from everyone from Kelley to Sears. We’re in unchartered territory now! One more! Bulldogs did a fine job containing Saunders. Crimson held Sears mostly in check, as well. Miller got a lot of good looks but could not pry the lid off. Good thing for Yale. Wonder what this game means for POY balloting. Jones vs Cormier tonight for COY? Wonder why a playoff, if needed, would be held in Phila? Why not a neutral venue fans and students might be able to reach more easily? Tigers and Quakers had several playoff games at Lehigh with great crowds. Congratulations to Yale and especially Coach Jones. No two individuals were more affected by Harvard’s change in academic requirements than James Jones and Sydney Johnson. Johnson wanted no part of competing against Tommy Amaker with lenient AI restrictions, so he bolted the league the first chance that he got. He wanted out, no matter his next destination. Jones chose to complain to The New York Times. When that didn’t slow down Harvard (the Crimson went from recruiting three-star players to recruiting four-star players), Jones resigned himself to his fate and settled in for the long, slow slog of competing with weaker recruits. He stuck around and, eight years into the Amaker era, Jones has been rewarded for his patience and hard work. James Jones, you deserve your (share of) the Ivy League title. This one tastes so much sweeter than the 2002 championship because you overcame so much more. I was skeptical of Bruno March giving Duren the edge in the Duren/Chambers preview piece, but man he was great yesterday. I could see Sears having a grown man game tonight. The All-Time Goat of Yale Basketball? My heart breaks for Sears. If there is an Ivy Hoops Online analog to the Sports Illustrated cover jinx, this was it. Justin Sears made the single most stupid decision in the history of Yale basketball, intentionally reaching out and batting the Dartmouth full-court press before it otherwise would have flown harmlessly out of bounds. If Yale loses the playoff game to Harvard on Saturday, Sears will for the rest of his life wake up in a cold sweat, asking himself why-oh-why did I do that. He is at risk to join Tom Williams and the fourth-and-22 fake punt only, for Sears, the stakes are higher. 53 years and counting of not playing in the NCAA tournament came down to his right hand reaching out to make history.